One of the last things the bearded fighters did before leaving this city was to drive to the market where traders lay their carpets out in the sand.The al-Qaida extremists bypassed the brightly-coloured, high-end synthetic floor coverings and stopped their pickup truck in front of a man selling more modest mats woven from desert grass, priced at $1.40 apiece. There they bought two bales of 25 mats each, and asked him to bundle them on top of the car, along with a stack of sticks. The tipsheet reflects how al-Qaida’s chapter in North Africa anticipated a military intervention that would make use of drones, as the battleground in the war on terror worldwide is shifting from boots on the ground to unmanned planes in the air. The presence of the document in Mali, first authored by a Yemeni, also shows the coordination between al-Qaida chapters, which security experts have called a source of increasing concern. “This new document… shows we are no longer dealing with an isolated local problem, but with an enemy which is reaching across continents to share advice,” said Bruce Riedel, a 30-year veteran of the CIA, now the director of the Intelligence Project at the Brookings Institute. New models of drones, such as the Harfung used by the French or the MQ-9 “Reaper,” sometimes have infrared sensors that can pick up the heat signature of a car whose engine has just been shut off. However, even an infrared sensor would have trouble detecting a car left under a mat tent overnight, so that its temperature is the same as on the surrounding ground, Leighton said. Unarmed drones are already being used by the French in Mali to collect intelligence on al-Qaida groups, and U.S. officials have said plans are underway to establish a new drone base in northwestern Africa. The U.S. recently signed a “status of forces agreement” with Niger, one of the nations bordering Mali, suggesting the drone base may be situated there and would be primarily used to gather intelligence to help the French. 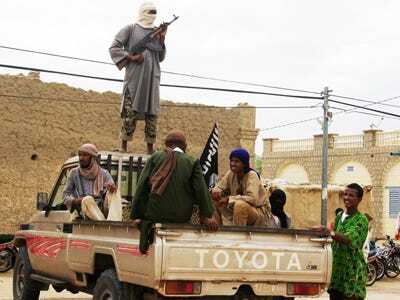 The author of the tipsheet found in Timbuktu is Abdallah bin Muhammad, the nom de guerre for a senior commander of al-Qaida in the Arabian Peninsula, the Yemen-based branch of the terror network. The document was first published in Arabic on an extremist website on June 2, 2011, a month after bin Laden’s death, according to Mathieu Guidere, a professor at the University of Toulouse. Guidere runs a database of statements by extremist groups, including al-Qaida in the Islamic Maghreb, and he reviewed and authenticated the document found by the AP. The idea of hiding under trees to avoid drones, which is tip No. 10, appears to be coming from the highest levels of the terror network. In a letter written by bin Laden and first published by the U.S. centre for Combating Terrorism, the terror mastermind instructs his followers to deliver a message to Abdelmalek Droukdel, the head of al-Qaida in the Islamic Maghreb, whose fighters have been active in Mali for at least a decade. Moustapha al-Housseini, an appliance repairman, was outside his shop fixing a client’s broken radio on the day the aerial bombardments began. He said he heard the sound of the planes and saw the Islamists at almost the same moment. Abou Zeid, the senior al-Qaida emir in the region, rushed to jam his car under a pair of tamarind trees outside the store. Asse Ag Imahalit, a gardener at a building in Timbuktu, said he was at first puzzled to see that the fighters sleeping inside the compound sent for large bags of sugar every day. Then, he said, he observed them mixing the sugar with dirt, adding water and using the sticky mixture to “paint” their cars. Residents said the cars of the al-Qaida fighters are permanently covered in mud. Ironically, the first drone attack on an al-Qaida figure in 2002 took out the head of the branch in Yemen — the same branch that authored the document found in Mali, according to Riedel. Drones began to be used in Iraq in 2006 and in Pakistan in 2007, but it wasn’t until 2009 that they became a hallmark of the war on terror, he said. Associated Press writers Baba Ahmed in Timbuktu, Mali, Robert Burns in Washington and Dalatou Mamane in Niamey, Niger contributed to this report. The document can be seen in Arabic and English at http://hosted.ap.org/specials/interactives/_international/_pdfs/al-qaida-papers-drones.pdf.